Although I have travelled abroad for work purposes before, the periods away have been reletively short and as a result the paperwork to be completed before travel has been pretty inocuous. 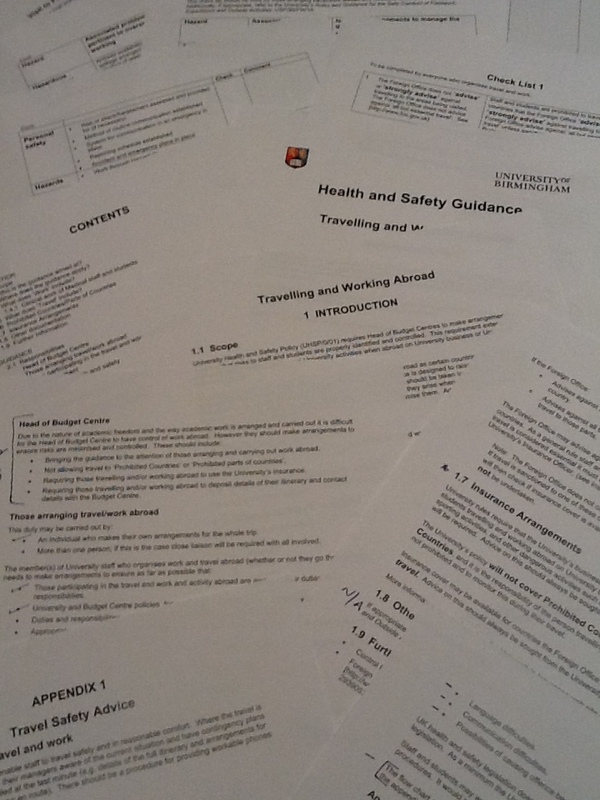 After an innocent request to our departmental administrator this week for details of our insurance policy, I was sent a link to the relevent web page and our Health and Safety Guidance notes for travelling and working abroad, which is 20 pages long! 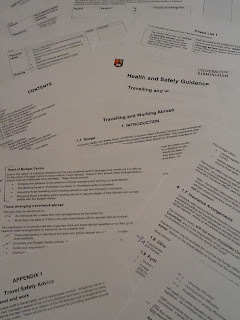 I have spent the last two evenings ploughing through the University rules and regulations, undertaking risk assessments and going through checklists, thankfully there is a flowchart included to help me manouvre through the process and which has actually turned out to be quite helpful. The rules and regs actually includes some pretty useful advice, and some useful (?) reminders about the hazards of visiting other countries. I consider myself a seasoned traveller, but after a couple of hours with this stuff last night, I had palpitations and was wondering what I thought I was doing taking myself out of my comfort zone and away from my loved ones to face who knows what!! I have just completed documenting my every (known) move whilst away complete with every contact detail on a spreadsheet and it makes interesting reading. With all the information in a single place, I realise that I will in fact be meeting a huge amount of people and traveling to many different institutions and locations, so it does make sense that someone here has all that information to hand, just in case there is an unforeseen problem. The lessons learned from this? I should have started this process weeks ago so it wouldn't have felt like such a huge job and it is a hugely important reminder, that although the trip will be informative and exciting, care does need to be taken when traveling alone for such an extended period. Now it's over, it was a useful exercise and one anyone else planning to undertake a study tour or extended trip faced with this additional work should do it!! !